The PowerFilm® Foldable Solar Chargers are extremely lightweight and compact. They are designed for users who need lightweight portable and remote power for laptops, cell phones, satellite phones, GPS units, and other devices and systems. For carrying, these chargers are folded into a small size that can easily be stowed in a backpack or laptop bag. Ultra compact to fit in pocket, backpack, or laptop bag. Comes with the RA-2 Female Cigarette Lighter Adapter. Unfold and place so solar panel (dark side) is face up with orientation to sun. With the grommets on each of the corners, use a tie cord to hold the panel in place. This is important to reduce loss or damage from high winds. You may leave the panel permanently connected to your battery since there is an included blocking diode in the junction box that blocks reverse draining of current from your battery. As with any permanent connection to a battery, safely clean the connections on a periodic basis as needed. To store the product, simply disconnect the cords and fold up. Use the Velcro® flap to hold the folded cell securely. 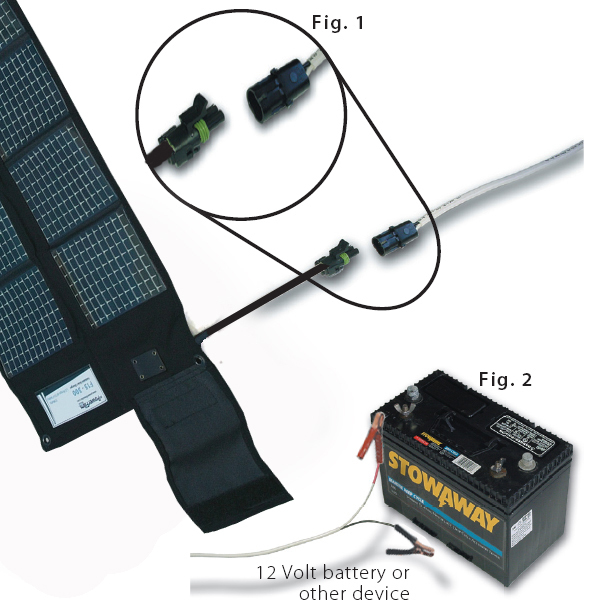 The internal batteries of your wireless electronics can be charged by connecting the PowerFilm® Foldable Solar Panel to your device's 12V cigarette lighter adapter. The RA-2 Female Cigarette Lighter Adapter is included free with any Foldable Solar Panel purchase. Use the chart below to find the appropriate charging accessory for your battery needs. The colummns are represented by the different battery types available for charging, and the rows pertain to the specific charging accessories. Now choose the optimal PowerFilm® Foldable Solar Panel to use with your selected battery charger pack. Also you can use the RA-6 Daisy Chain Accessory to connect 2 Foldable solar panels together for greater power.